Discus: Group ‘B,’ behind the west grandstand contained the lower seeded throwers. Steady Fred Samuelson of Sweden managed a 42.64m. 5/26-27 44th Hypo-Bank Meeting, Mosle Stadium, Götzis. 100m: In the 4th race with ANA (Authorized Neutral Athlete- meaning Russia) was in lane 6 but finished last in 11.09. The race waqs won by Sweden’s Fred Samuelsson. 110m Hurdles: The second hurdle race was exciting went to Mattias Brugger/GER as he ran stride for stride with Fredrik Samuelson/SWE and out-leaned him, both getting significant PRs, 14.06 to 14.10. Wind +1.4 mps. Discus: A deca career best for Fredrik Samuelsson, 40.03m/131-4. Pole Vault: In B Samuelsson was the first over at 4.80m/15-9. Yet a few minutes later, in the lower seeded pit, Fredrik Samuelson/SWE managed 5.00m/16-43⁄4 and then went racing into the crowd for high 5’s. His shot at a world champs invite (8100) looked very positive for the 22 year old. Summary: When the dust cleared 15 (!) had exceeded 8k, 12 over 8100. That’s quite a haul. 9 of 23 PR’d! Sweden’s 22 year old Fredrik Samuelsson PR’s at 8172 and won the meet’s ‘Rookie” award. 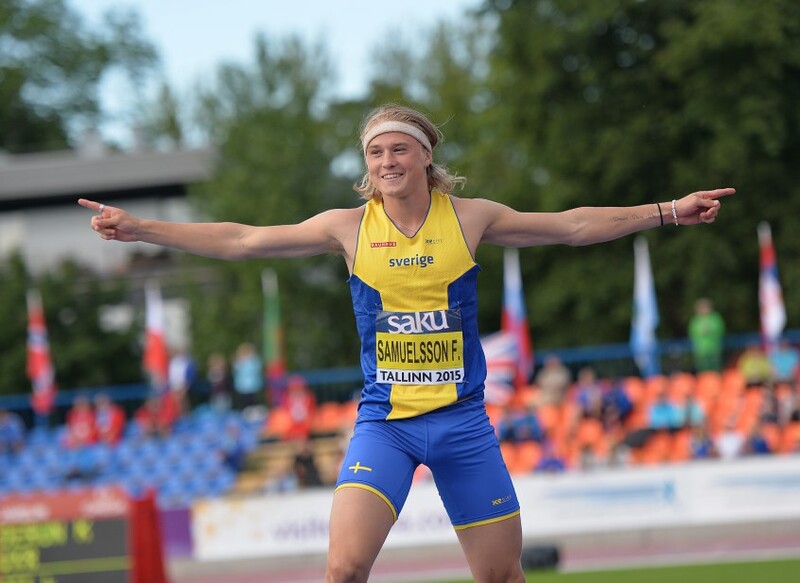 100m: Young Swedish talent Fredrik Samuelson (his father was a student at Blinn JC in 1980s) was 2nd in a PR 10.81. A talented younger brother makes them one of the world’s top father-son-son combo. Shot Put: In Group B Swede Fredrik Samuelsson won with a 14.40m/47-3 effort while many watched LePage whose sphere covered 13.26m/43-6 of Voralberg real estate. High Jump: Others who were well ahead of PR pace were Ashley Bryant/GBR, Pawel Wiesolek/POL, Fredrik Samuelson/SWE and Pieter Braun/NED. 400m: Amid the crowd cheers Frederik Samuelson/SWE won the 2nd race out of lane 2. His 49.26 was 18/100ths off a career best.